THROUGHOUT HIS LIFE GAUGUIN HAD ADMIRED DEGAS, written in January and February of 1903 (only a few months after this picture was executed), Degas is the contemporary painter most frequently mentioned. In that same manuscript Gauguin also wrote: "Study the silhouette of every object; distinctness of outline is the attribute of the hand that is not enfeebled by any hesitation of will." It was indeed for such incisiveness of vision (as well as of wit and will so like his own) that he admired Degas. 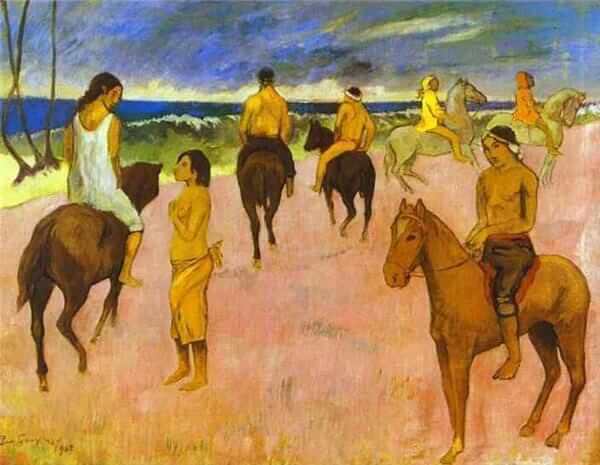 This picture, painted on that shore of Atuana which he could see from his last native home, seems created out of a reminiscence of Degas' paintings and exemplifies the power that Gauguin, sick though he was, kept until the end. For though its setting is so different from Degas' elegant scenes of the Longchamps track, its space, its isolation of the figures, its clarity of outline that makes of each horse a closed form, and the sense of rhythmic interval, all are akin to the older master's vision. And the handling suggests both the past and the future: the brush strokes of the sky, even its color, reach back to the Impressionists, but the pink of the foreground, which is Gauguin's own, points forward toward the Fauves. And not only the Fauves, for these pastel shades, the sparseness of the horses, and the symbolic shorthand of the two on the upper right, are close in feeling to pictures of Picasso, done only a little later. "I have wished to establish the right to dare anything...," wrote Gauguin just before he died, "the public owes me nothing, since my achievement in painting is only relatively good, but the painters - who today profit by this liberty - they owe something to me."